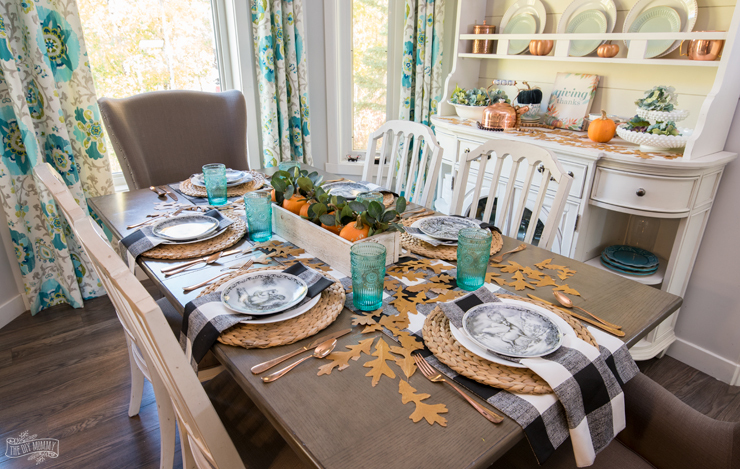 You don’t need to spend a lot of time & money to make a beautiful looking table setting this Thanksgiving. 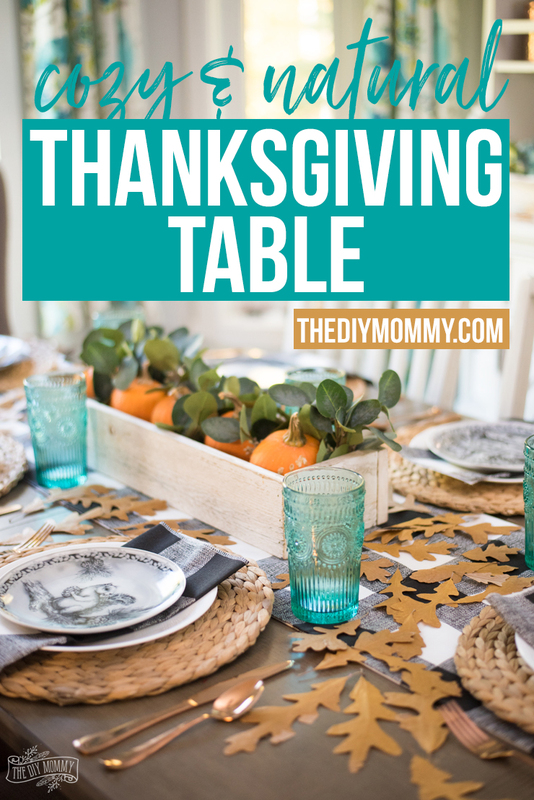 Let me share with you my cozy & natural Thanksgiving table, and make sure to visit all of my fellow Canadian blogging friends’ Thanksgiving table ideas at the bottom of this post! Thanksgiving is already next Monday for us Canadians, and it really snuck up on me! It appears I’m hosting our family meal now, so I had to come up with a festive tablescape idea that was quick to put together. 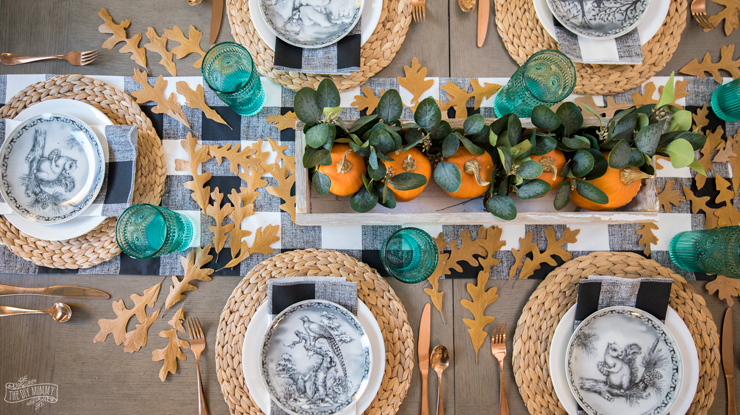 The inspiration for this table setting idea came from the great outdoors. We’ve harvested lots of cute little baby pumpkins from our pumpkin patch this year, and when I picked up Little B from playschool last week, I came across these gorgeous copper coloured oak leaves on the ground. 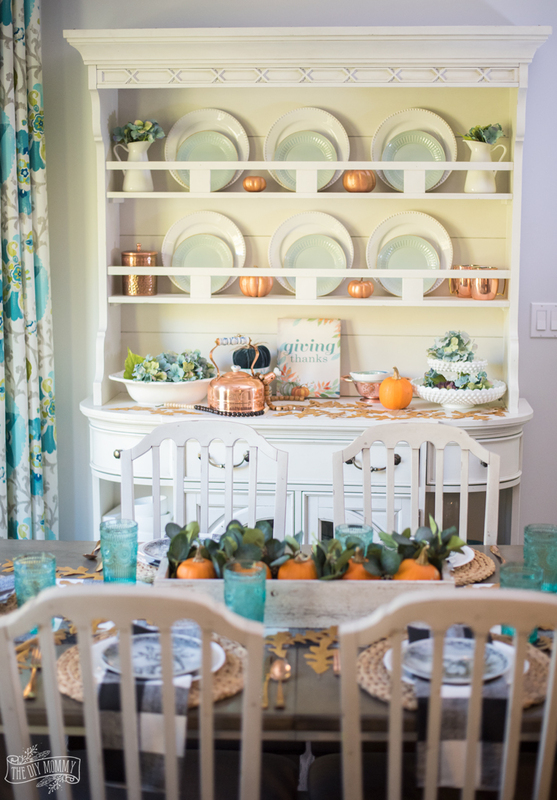 The leaves matched so well with the copper accents that I already have in our Fall decor (see our Fall home tour here), so I pressed them in a book and then when they were dry I used them on our Thanksgiving table (and to decorate our hutch). I had made the black & white buffalo check table runner and napkins for a recent project (you’ll see that soon), and decided they were fabulously Fall-like and looked great with the coppers and blues I already have. (Don’t want to sew? Check out my no-sew table runner tutorial here.) The wicker placemats are from Ikea, the woodland plates are from Urban Barn a couple of years ago, and the cutlery & glasses are from Walmart. I already had all of these on hand and I love how they work together! The centerpieces is a barnwood box my friend made for me a couple of years ago, and our garden pumpkins fit so perfectly inside! I added a bit of faux eucalyptus for some interest. I added a couple of the garden pumpkins to our hutch decor to tie it into the table, and I’m so happy with how simple and pretty this setting looks! I can’t wait to enjoy Thanksgiving dinner here next week with my family. I agree, Thanksgiving snuck up on us this year! 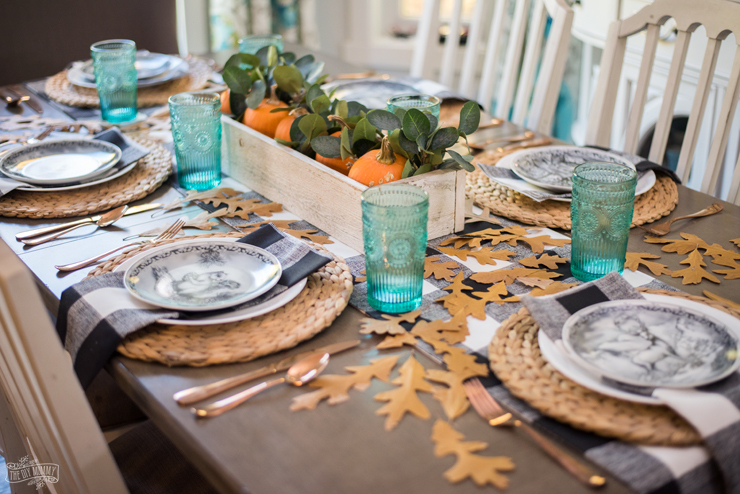 Your colour scheme is perfect, with the copper leaves and the teal glasses. 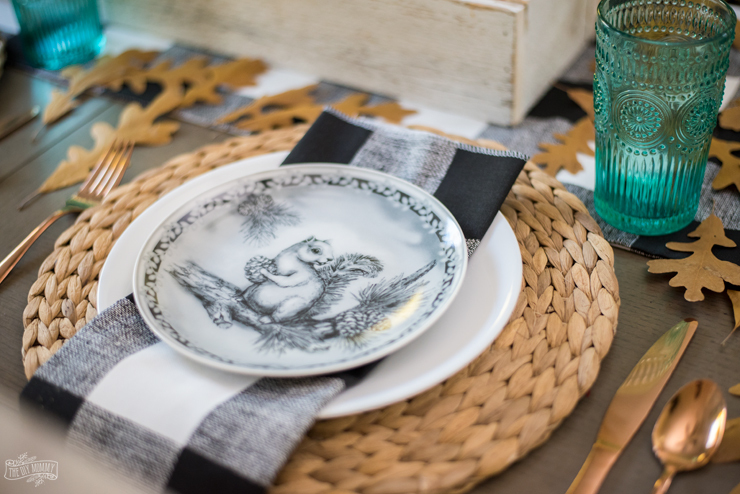 I also love the woodland plates and your napkins and table runner. It’s all so pretty! How sweet that you grow your own pumpkins. Happy Thanksgiving! We love how you feel like your on a forest path viewing the tablescape. That’s so awesome. Thanks for stopping by. I agree about Thanksgiving as well, totally came out of nowhere! Loving your table Christina and the colour combo is so fun and pretty! Love all your fall touches. Such a pretty table. I love the way you used the dry leaves, and the little plates are so sweet. Happy Thanksgiving! It all ties together beautifully! I love it! The little touches of blue are sweet, and the runner is fabulous! Such a welcoming table. 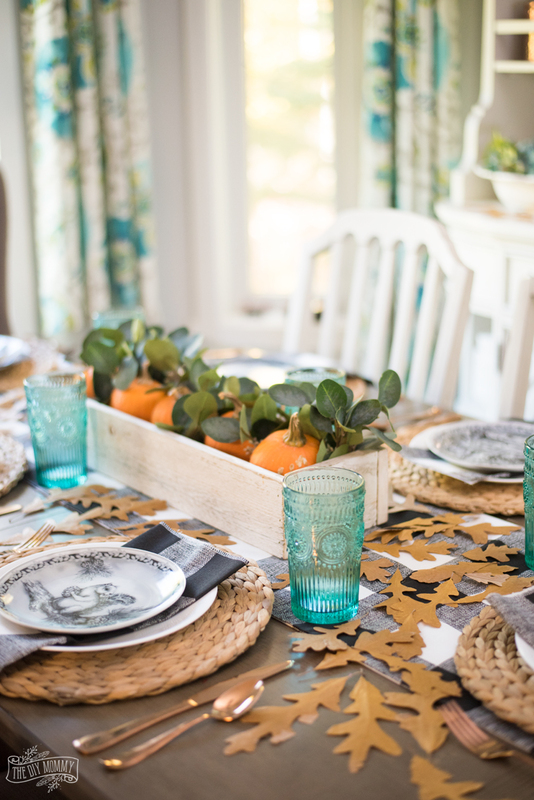 I love your beautiful Thanksgiving table! The pops of blue are gorgeous! Happy holiday!